Simple, easy, comforting and oh so tasty!! This is one of my go-to Fall recipes…partly because of how easy it is to make. Now I know some of you are muttering under your breath and talking smack about this legume but just trust me on this one. If it’s been a while since you last tried them, then try this recipe. I promise it’s greater than the sum of its parts. I grew up eating lentil soup that was good – and sorry Mom – but this one kicks tush! Yeah…just in case she’s reading I’m watching my language. Also, try black lentils…they have a unique taste and texture that sets them aside from their brown cousins. BTW stick to either brown or black lentils; the red and yellow varieties are excellent but they cook much faster and tend to dissolve when they do so they’re not well suited to this recipe. Thanks a million to my friend, Anil, in Pune who taught me all about the red and yellow varieties. Peel and dice the carrots, dice the celery and onion. Note: I like to cut the carrots in quarters lengthwise and then dice into ¼ inch pieces. The celery I cut by slicing in half or thirds lengthwise (depending on how thick the stalks are) and then dicing the same size as the carrots. Smash the garlic with the flat side of the knife and then mince. Heat the oil in the pot and then add the onion, carrots, and celery. Sauté until the onions begin to turn translucent. Add the garlic, thyme, salt, and pepper and sauté until all the vegetables are tender, about 2 – 3 minutes. Crust the tomatoes with your hands and add them to the pot along with their juices. Simmer until the juices evaporate and the tomatoes break down, stirring occasionally, about 5 minutes. Add the lentils and mix until they’re coated with the tomato. Add the broth and stir. Bring to a boil over high heat. Cover and simmer over low heat until the lentils are almost tender, about 20 minutes. Add the pasta and stir for a few seconds. Simmer until the pasta is al dente, about 5 – 7 minutes. Taste and adjust the salt and pepper as needed. Sprinkle with a bit of parm, drizzle with a touch of EVOO and enjoy! This goes great with a crusty piece of bread, crostini or bruschetta. Don’t have canned tomatoes? Throw in some fresh tomatoes…they work beautifully! Don’t like lentils…see your counselor. Kidding! Kidding! This would work really well with any bean really except the cooking time for dried beans are much longer (About 2 hours plus soaking time). Check out the recipe for cooking beans and then add them in after the pasta is done. PS – Use the stock if you can rather than water. It adds so much flavor to the soup. I just saw it! You rocked this recipe!! I love your photographs also. Super job!! Thank you! Or regular ol’ brown lentils work as well. If you have Whole Foods or Trader Joes near you you can get black lentils there. Hope this turned out for you! Looks so good, I’m also a lover of all lentils! I am so trying this soon!! Looks yummy! 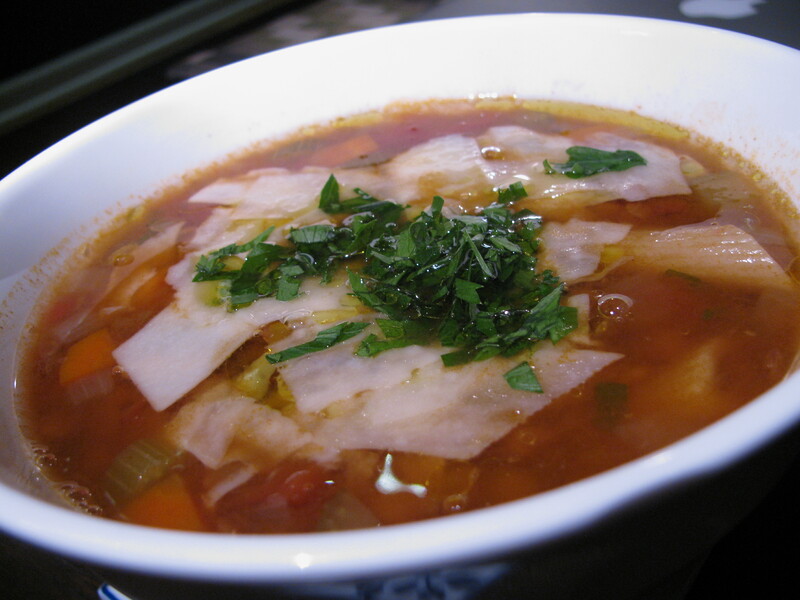 earthy and healty soup to start up a day…. This recipe looks tasty, especially with the cheesy topping! Do you have any special tricks to avoid bland lentils? I often find the flavor of lentils a bit lacking…unless I add some cheese or extra salt to the recipe. Thanks in advance!